Synopsis (via Goodreads): One summer will challenge everything the Garrett sisters thought they knew about themselves—and each other. This was the perfect summer read! Jessica Spotswood has successfully made me want to buy a boat and live near a marina. Just the idea of laying on the deck and watching fireworks makes me smile! It sounds so relaxing and fun. One of the sisters, Bea, makes a comment about it being like a tiny house on the water, which would definitely force me to be a minimalist. The Last Summer of the Garrett Girls had a very Gilmore Girls vibe that I enjoyed. They live in a small town where it's impossible to keep secrets, and the townspeople live for the gossip. There are also no strangers except for the tourists they occasionally see throughout the year. There's an old bookstore, a Tabby Cat Café that has literal cats (they can also be adopted from there! ), and even a yearly reenactment that people get really excited about. I loved their Gram and how accepting she was of her grandchildren. They were all so very different, and she treasured them like they were her own. The girls also appreciated their Gram and how much she's done for them over the years. She trusts them to do what is right, and is there for them when they make a mistake. I feel like there was a lot that could have been elaborated on, but I understand that can be difficult when you're telling a story through five different perspectives. There is a lot going on in each of their lives, and unfortunately some of the details were left out. They were small threads that I was following in the background, but most of them are never mentioned again. An example would be Bea's movie date with Erik and how Savannah taunted her with bringing Gabe. Bea gets ready for her date, but we have now idea how it went or if Savannah followed through with her threat. Bea was also really nervous about the date, and I was curious about how it ended. The bookstore belongs to the Garrett family, and the author references a lot of YA authors and titles. She specifically mentions Nina LaCour and a variety of LGBTQ books. One of the characters is openly gay, another is bisexual, and one is still figuring things out. 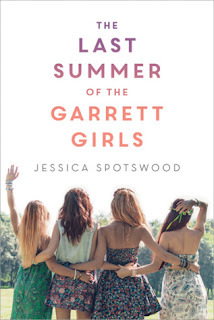 I thought Jessica Spotswood did a wonderful job of creating characters that a lot of people will be able to relate to. There are a lot of Harry Potter references. Pets were named Remus, Sirius and Crookshanks, but there were also a lot of shirts and sayings that related to the books. It felt a little forced at times, but it wasn't too over-the-top. I was also happy about the X-Men shout out! Three of the horses were named Storm, Gambit and Rogue. I think there were a lot of good points made about women's rights, equality and acceptance. 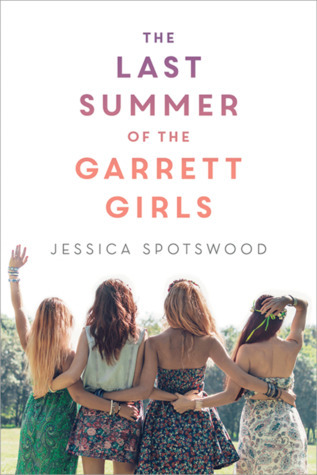 The Last Summer of the Garrett Girls touches on family, friendships and how those two things can change over time. It was a fun story that I really enjoyed reading and had a hard time putting down. Every chapter was about a different sister, and I was quickly caught up in each of their stories. There were a few times when I cringed internally at someone's behavior or actions, but that's life. People make mistakes, but it's how they learn and grow from them that matters. I think each individual sister did a lot of growing over the summer, and I thought their story ended in a really great place. I have an old book by this atuhor but I haven't tried it yet. I believe I've read another book by this author, but if I did it was a long time ago! What book do you have? References to pop culture can go either way. A few sprinkled throughout can be fun, especially if it relates to the story but it can go overboard or feel forced. I love music in books but I just read one that referenced a song almost every paragraph and it had nothing to do with anything and annoyed me. Anyway...this does sound like a good summer read. Ack! Every paragraph? That would make me crazy. I feel like there is a time and a place for references like that, and they can be awesome when done well, but it's not fun when they feel forced. That does sound like a good story. It was! Have you read any of the author's other books? Sounds like a great summer, beach read. Maybe the author could have given each girl her own book though???? Still sounds cute. I'm not sure if each sister would have had enough individually to fill an entire book, but it's possible. I enjoyed the various perspectives and seeing how multiple people could view one situation so differently. It made the story more interesting! There lives were so intertwined, but then they also weren't... it was a wonderful story about family and life. 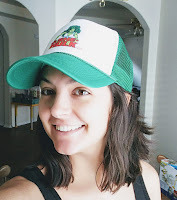 I like stories about sisters, and the small-town vibe sounds very fun! Me too! Have you read The Summer of Firsts and Lasts by Terra Elan McVoy? It's SUPER good! It's one of my re-reads every summer. This does sound like a great summer read! It was a great summer read! I have a sudden desire to re-watch Gilmore Girls and shoot fireworks, lol. I feel like I’ve seen Spotswood’s name a lot but I’ve never picked up anything by her. This one sounds like a solid YA contemporary. I like the fact that the author allowed the characters to make mistakes... reading about “perfect” characters is so boring (and unrealistic). And the grandmother sounds great! Love the addition of the pop culture references! :) Great review, Lindsi! That's how I feel! I know I've seen her name on something else, and I'm pretty sure I've read another book by her. I'd have to look on Goodreads to make sure, but it's not standing out. The characters make a lot of mistakes, but they did feel authentic and were well-written. They were things normal people/teenagers struggle with every day. It was nice to read about realistic situations and watch how everything played out. I love multiple POVs-it's my favorite to read! This sounds like a quick, cute read though and i wanna pick it up now! It sounds like this book would be perfect for you, lol. I've noticed a few grandmothers playing more significant roles lately! It's always fun to see how they bridge the generational gap. Sometimes the grandparents are accepting and understanding, but not always. Same! It's like this book signified summer for me this year, haha. And I agree with you... all of the sisters had a very unique voice that separated them from one another. I really enjoyed seeing their small town through multiple perspectives. I'm a little peeved with the boys in this book (except for Gabe). They were pretty clueless at times, and Adam was just downright awful. Even if I personally don't enjoy contemporary books that much (except in very specific cases), I'm glad that stories like this are available for those who do, finally with enough variety on the sexual spectrum - and not just your usual token gay character! I'm curious... what do you not like about contemporary books? They're not my go-to, but I've enjoyed the ones I've read recently! I liked that the author was very inclusive with her characters. Interesting! I do love books that are contemporary with a twist! Have you read the Hidden Legacy series by Ilona Andrews? I think it's something you might enjoy! I believe they're self-publishing (she co-writes with her partner, I think) so fans can have a conclusion to the series. Weird stuff, huh? I read a review the other day for a book about weredeer. Yes, that's right... WereDEER. It sounded so strange, but also like it could be good...? I haven't read that series, though I think I've heard of it...I don't remember what it's about though (I'll look it up on GR). Weredeer? Haha, that's new. If one is into "creatures" and fantasy, which I'm not...as a rule (except a selected few vampires). But at least they tried a new spin on the "were-" trope. As long as it's not wererats or werecockroaches 😂. Haha! Sorry if you did! I hate the beasts so much. Even in drawings. But I suppose it was Jessica Jones' fault if I went there 😂.